Watchable period bed-hopping drama, enlivened by a trio of terrific performances from Ricci, Thurman and Scott Thomas, though Pattinson never quite convinces in the lead and the script is occasionally frustrating. Directed by Declan Donnellan and Nick Ormerod (who founded the Cheek By Jowl theatre company), Bel Ami is based on the 1885 novel by Guy de Maupassant and stars Robert Pattinson as Georges Duroy, a handsome, penniless charmer who's recently been discharged from the army. When he meets former comrade Charles (Philip Glenister), he's offered a job as a journalist, despite barely knowing how to string a sentence together. However, Charles' wife Madeleine takes pity on George and helps him write his gossip pieces, giving him an unearned cachet amongst society ladies and earning him the nickname Bel Ami. His advances rejected by Madeleine, George begins an affair with married Clotilde (Christina Ricci), only to marry Madeleine when Charles unexpectedly dies. However, after George clashes with the owner of the newspaper (Colm Meaney), he then begins an affair with his wife, the volatile Madame Rousset (Kristin Scott Thomas). As a bedroom farce, Bel Ami definitely has its moments, thanks to a particularly saucy performance from Christina Ricci and terrific work from both Thurman (giving her best performance in ages) and the always reliable Kristin Scott Thomas (delightfully unhinged and coming across a little like a Twilight Mom with her rampant Pattinson lusting). Similarly, the production design is impressive and the script manages some subtle commentary on today's society in its depiction of both the behind-the-scenes political wrangling and the idea of George rising to fame and fortune without any noticeable talent. The main problem is that Pattinson is too wooden and blank-faced to really convince as a dyed-in-the-wool charmer and it doesn't help that he has zero chemistry with any of his three co-stars; in fact, the only moment he comes alive is in his playful scenes with Clotilde's little sister. In addition, this has a knock-on effect on the script, because you're never sure if George is scheming and therefore fully aware of what he's doing or if he's just a dumb prettyboy being manipulated by everyone around him. 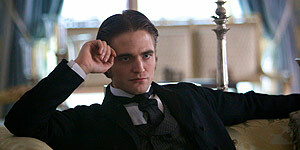 Despite Pattinson's lacklustre central performance, Bel Ami remains watchable thanks to lively and engaging turns from his three co-stars, but it's not quite as dramatically satisfying as it should have been.